If you're looking for NBUS Challenge #3, please click HERE. Speaking of, you talented card artists are knocking my socks off with your incredible support and partysipation in the NBUS Challenge! The gallery had over a hunnert cards only four days in! Remember, for Challenge #3, I am featuring Stamplorations, but if you win, you are welcome to choose a gift card from a different domestic company. Please make sure you read the RULES to be eligible for a prize. MWAH! Even though it hasn't been that long since we were all frivoliking in New Year's Eve celebrations, other parties and events must carry on throughout the month. As such, my card today is attending an elegant January birthday party! The beautiful classic black ball gown is bejeweled with a snowflake which you might even say is from out of this world! The circle of rare blue sapphires was last worn by Princess Grace on the cover of Life magazine, April 11, 1965. Today, with the invention of dies, it's easy to make QACAS cards from the comfort of your own home. This card has a PTI true black base and white insert. It will be worn with black velvet slingbacks with rhinostoned adornaments and matching clutch. The NBUS "snowflake" is by Memory Box ("Orbit Circle") and the NBUS sediment (severed between the outside and the inside) is also by Memory Box ("Happy Birthday Garland"). Darn. Now that I look at it, I should have adhered that "birthday" down near the bottom and on the edge so it lined up with the front when you opened it. Owell. The idea germ for this card came from the current fun challenge at Less Is More ~ "black, metallic, and one other colour." 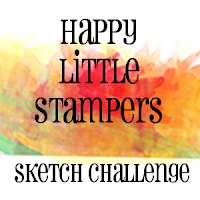 Happy Little Stampers ~ sketch challenge (see below). 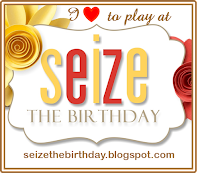 Seize the Birthday ~ "Happy 2015" with a topping of "Party." 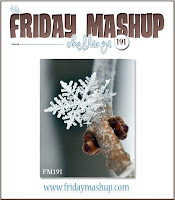 The Friday Mashup! ~ "Winter Project with Snowflakes." To join in the fun, you can click on the links to find details about rules, sponsors, and prizes! Tiziana Biagioli of Sweet and Coloured. Tiziana lives near Rome and has been blogging since June of 2013. She is a painter in all mediums and also makes beautifully colored and detailed cards. She loves entering challenges, has won many awards, and is also on several design teams. I think you'll love her sweet and charming card art! Rocky of Rocky's Crafting Blog. Rocky, from the UK (my 700th follower! ), has been blogging since June of 2010. In addition to participating in challenges and being on several design teams, Rocky is a freelance demonstrator and workshop teacher. Her cards, tags, and projects will keep you mesmerized and you'll appreciate Rocky's detailed directions! Lizzy Hill of Dream of Tomorrow, Live Today. Lizzy is from Australia and she has been blogging since February of 2012. She is a card artist and a scrapbooker who also loves mixed media and has created some marvelous 3D projects. I think you'll be very impressed and inspired by Lizzy as she shares details of her projects with you! Cheryl Winget of Paper Panacea. Cheryl is from the USA and has been blogging since May of 2012. She is a wife, mother, and grandmother of ten! I'm so jealous!! When she isn't busy grandmothering, she makes beautiful cards and plays in challenges. She often shares the fabulous cards that her sister makes so you get double the inspiration and fun! Kath Buckell of Handmade by Kath. Kath is from the UK and has been blogging since 2011. She has been crafting since she was a child and made clothes for her dolls. In addition to making cards, Kath has enjoyed crewel work, cross-stitch, woodwork, flower arranging, cake decorating, and sugarcraft. You'll be awestruck when you see some of her extraordinary CAS cards and her unique designs! Thank you so much for joining, ladies, and welcome to the Playhouse! I love how international our Corner is today! You write such fun posts Darnell ... I've had to stop reading every few words v for a little chuckle to myself! Superb take on our challenge. Utterly glam, sophisticated CAS. Such a stunning card Darnell. Your design is so elegant, the colours are wonderful and the circle of blue sapphires. Fabulous cards Darnell - my favourite is the first one with the 'snowflake' - very stylish. Thanks for your welcome and link to my blog. Very classy cards Darnell love that snowflake! Wow that is so elegant and I can just see you in a dress to match. Woozers...love all the fabulous silver Darnell. I could picture myself on the red carpet or dancing the whole night long with this gorgeous (LBD) card. Just stunning. Have a nice day. Happy New year Darnell! Beautiful cards with the dies! Such a pretty and sparkly card! Ooooh, pretty! Love all the glittery goodness! Way to bring in the new year -- all sparkly and gorgeous! LOVE the sparkle and shine "Kinda like your personality" :-)I want to play, just haven't had time. It's my busiest time of the year at work :-( Happy New Year! So very pretty, Darnell. I love all the glitter, especially on the corner and inside, where it is unexpected. Loving the sparkle and shine against the black - nice touch with the circle of blue gems. Darnell, my sparkly heart is enamored with this glittery creation! It's stunning! The ultra-sparkly silver atop the black is exquisite and I love the royal blue circle of gems! A gorgeous card and a fun post, as always! I will soon be playing in your NBUS challenge! I linked up too much with my current one before remember that part of the rule.. I am excited to play along soon. Your blog is such a fun place. :o) Have a happy day, my friend! Very glamorous, Darnell!! Sparkling and elegant. LOVE!! And...wow...you are so generous with adding the extra chances for wonderful gift cards in your NBUS challenge!! You are a sweetie!! LOVE all the fab glitter, Darnell! Thanks for joining us at Merry Monday! Hugs! I love the silver and blue together. It is so rich looking. I love the sparkle your card has. Glitter is a girl's best friend! You can never layer enough of it on one card. And Holy SCHMOLY rocky! 10 gift cards?! You are the queen of generosity! I LOVE you your sense of style darling friend! You & Princeass Grace...twins. Your card is spectacular....great design..love the placement of the front sentiment. Great post as always and a gorgeous sparkly card. A gorgeous card Darnell, such a stunning design. Looks perfect to me! A crowning glory of a card! Beautiful! LOVE your elegant card! Thank you so much for featuring me as a new friend today. I am really enjoying your blog posts. So glad I joined up!! Now THIS is a snazzy birthday card!! Such great sparkle and I love the happy on the bottom corner. Thanks SO VERY much for my adorable birthday card, you're a peach! Darnell, I had to come back to your blog today. I was on SOS and saw that you were signed up!! I wish I was ahead of you so I could get your card! Maybe next time. Toodles. Darnell...this is just beautiful. I love all the glittery silver. what a festive way to say happy birthday to someone special. Gorgeous! Can I borrow that for my next cocktail party?! The blue bling is perfect! What a stunning card! So elegant and sparkly! I also love your photo with the glitter background and bottom! I swear those little blue gems are blinking all the way around when I look the slightest bit away. No, I have not been drinking! Anyway I love this beautiful birthday card! Congrats on another huge success on NBUB! What a stunning creation! It's so elegant and regal and I LOVE the circle of sapphires! Love the sparkle and the glitz! Beautiful! Absolutely stunning card, Darnell! What a great January BD card! PS--thanks for introducing me to W2SB--what a surprise to be on the DT a few months later! A real stunner, Darnell--so elegant! Love the silver on black and the ring of sapphires! WOW! Love this .....you can't go wrong with a bit of sparkle! The touch of blue looks fab too. Hi, Darnell!!!! Oh, boy, December has gone long ago and all the X-mas decorations has been packed in boxes till December comes again, and I've been on holiday in Cape Town and now I'm back and I am (again!!!!) catching up on blogvisits (what's new??? LOL!!!!) I hope you and yours had a fabulous, blessed X-mas time and that the new year has treated you only well so far!!!!! 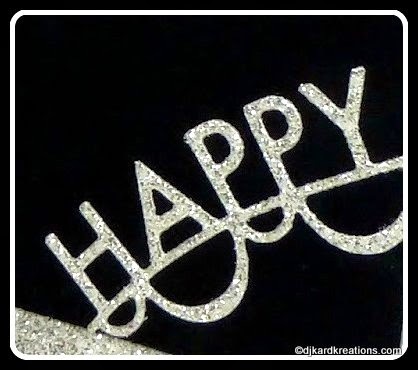 I would love to wish you a very happy 2015!!! May your days be filled with fun and laughter and happiness!!!! I have spent some time with you now, enjoying the last 8 posts you did since I last visited somewhere during 2014!!! I loved all the cards I saw and the lovely family photos and I had a good LOL every now and again!!!! Always such a joy to visit your blog!!! And there's a new NBUS challenge going!!! ... will have to dig into my boxes of stamps and stuff and come up with an entry or two!!! OK, will leave you with that for the moment!! My little black dress should be so well adorned. :-) I think you could do a NBUS challenge every month, Darnell (even without prizes) and you'd get the same response. It's just the push we need. Wow, look at the sparkle! A great New Year's card or January birthday card. Thanks for joining the Friday Mashup this week. Oh what fun! love glittery winter card! Happy New Year Darnell, I see you are off to a fabulous start with your sparkly delight. Wow oh Wow! This is wonderful Honey. I just want to touch it as it looks so tactile. Love this in case you did not realise! Gorgeous card!! I love the sparkle and elegance of it. Please post a picture of you in the outfit that matches it. I love that die you used as well. This is decidedly twinkly Darnell, super regal card! Love that sparkly snowflake against the black, but it's the blue sapphires that won my heart - so pretty! Thanks for sponsoring a fabulous challenge again! Blue jewels takes this card over the top! Splendidly done! Well, now THAT'S a fun birthday card! Great sparkle :) Thanks for sharing with us at The Friday Mashup this week. Darnell. Thank you for stopping by my blog and joining. I love the sparkle of both your cards and look forward to seeing more of your work. Such an elegant sparkly card Darnell... anyone would be thrilled to receive such a gorgeous creation. So elegant and CAS!! I love the glitter! The black and silver really pop!! Fantastic card Darnell. Love the silver on back. Very elegant! Ooh Darnell this is gorgeous. Looks like a piece of very expensive jewelry. Wow, this is gorgeous Darnell. Love the silver sparkle on the black and the touch of blue jewels is perfect. Thanks for sharing this beauty with us at Seize the Birthday. Very pretty ...love all the sparkle! Love love love this one Darnell. Just back from a CA vacation seeing my Dad and am catching up on my reading. Hope you had a lovely holiday, and that your new year is filled with crafty fun. Happy really needs to venture off on its own more often, proving that it alone can rock the Wowometer to the max! Of course, the bedazzledness of the paper and Grace Kelly's jewels contribute to the off-the-charts Richter Scale reading! So happy to see this beautiful card in the gallery at Seize the Birthday! Very Pretty Darnell! I love dropping by over here and seeing what you have been up to! Thanks for sharing your talents with us at Seize the Birthday! Happy New Year too! The perfect word for this card is STUNNING! I love how the glitter and blue bling looks on the black, so pretty! Thanks for playing with us at Merry Monday this week! Gorgeous, beautiful, sparkly, flashy, glitzy - all are words which describe this amazing card!!! WOW - I am in love with the sediment die cut that you have used - wonderful, is a word to describe that!! You, my dear Darnell, are all things good and crafty!! Have a beautiful day!! Stunning Birthday card, love the commentary Darnell. Thanks for sharing at Merry Monday.